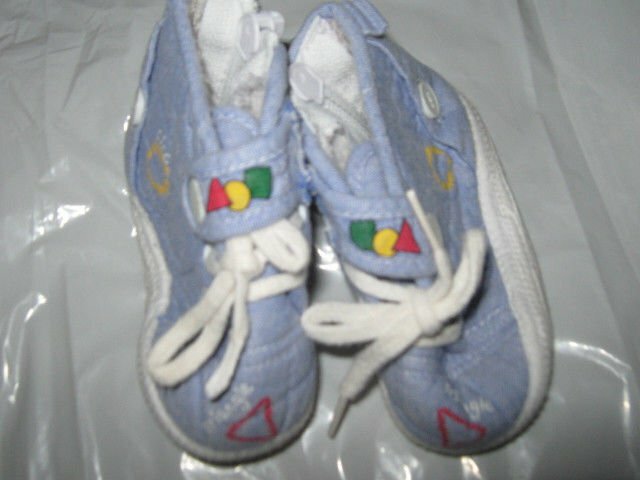 This product is forDESCRIPTION Item: (1) Boy's Blue Quilted ShoesColor: Blue - AS SHOWNCondition: NWOTSize: 3Has zipper on side & shoelaces on topThis item is Brand New - Never worn. NWOTPlease read listing carefully. Contact me through eCRATER if you have any questions. If an item is pre-owned, it will be noted in listing.I try very hard to describe items the best I can. Please be aware that colors can vary on computer monitors. PAYMENTPaypal only.You will be notified within 24 hours after product ends. Please remit payment within 4 days of our notification. We follow eCRATER's Non-Paying buyder Policies. If you’re having financial problems, don't buy.Please review and agree with all our policies contained on this page before looking. You will be held responsible for your buy! ALL SALES ARE FINAL DUE TO THE NATURE OF THE SALE I WILL ONLY REFUND IF ITEM IS NOT AS STATEDRETURNS & REFUNDSWe offer a 7 days refund policy only if the items sold are found to be incorrectly described. We’re not responsible for pictures showing incorrectly on your monitor. The refunds will only be made if the following return guidelines are followed: Buyer is responsible for return shipping costs. Subject to restocking fees to cover the original shipping costs plus selling fees. The item must be returned in all the original packaging, including cartons, boxes and must not have been used, cleaned or laundered & tags still attached if there are tags.. All returns must be boxed and packed securely for shipping. Refunds are within 7 days from the day the customer received the original item. If the item is found to be as described you will receive a refund of your winning buy minus shipping both ways and a 15% restocking fee. We may except returns that do not qualify under our return policy. These returns will only be accepted at our discretion and a restocking fee may apply. Refund will be made within 5 days of getting the item back.Please inspect item when you receive it. I try very hard to inspect items before listing….if there are any defects or flaws, they will be noted in listing. If you find that I missed something, please let me know. If you decide to return an item, please use eCRATER’s return process as it is easier and faster to process refunds. SHIPPINGLOWER 48 STATES shipping cost for this item will be $9.00We utilize UPS ground or USPS for our shipping services. (Please contact us for P.O.BOX, APO, HI, PR, AK and INTERNATIONAL shipping rates).Please note that our shipping charges are actual charges and we are not keeping money from it. All items are shipped via USPS 1st Class Mail or Priority within 24 - 48 hours of receiving payment.Items are shipped to the paypal mailing address. Please make sure your shipping address is correct – I cannot be responsible for an incorrect address. If an item has shipped and is returned to me due to incorrect address, the buyer is responsible for the cost to reship it. If it is returned to me and you do not want it reshipped, it is subject to restocking fees as described in the return section.INTERNATIONAL SHIPPING(Please contact us for P.O.BOX, APO, HI, PR, AK and INTERNATIONAL shipping rates before looking).WE DO COMBINE SHIPPING1. We combine products for up to 3 days.2. Please notify me thru eCRATER’s messaging that you are looking on more than 1 product.3. Only one payment must be submitted for all products, we will not combine products paid with different payments.CALCULATING COMBINED SHIPPINGTo calculate combined shipping we charge the highest shipping of all the items won and then 50% of the shipping in the additional items.FEEDBACKWe strive for 5 stars feedback. Please take a moment to leave us positive feedback. If you have any concerns or questions about your item once you've received it PLEASE contact us. Once your item is shipped you will receive an email.We will work hard to please our customers so please give us a chance to solve any problems before leaving a neutral or negative feedback. We guarantee that we will resolve any problem immediately. Please give us the opportunity to help you. We are not responsible for pictures showing incorrectly on your monitor. NOTE: Please note that we are closed on weekends, therefore we will answer to your emails during the week.Check out the other Items I currently have Listed &Be sure to add me to your favorites list! "Thanks for Looking & Good Luck!!"